In 2000, two years before Seattle Cascades became a World Championship World Class Finalist for the corps' first and only time, the corps won the Division III World Championship and placed 23rd in the Division I Quarterfinals. 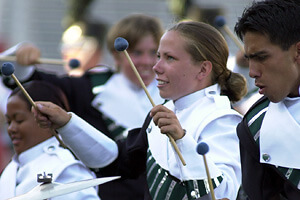 In 2001, the corps moved up to Division II competition, placing second in that class and 17th in the Division I Semifinals. Then came the magical season of 2002. After placing in the Finals of both the DCI Southwestern Championship in San Antonio and the DCI Midwestern Championship in Indianapolis, there was a lot of speculation about the corps making the Finals when the World Championships came to Madison. However, some fans wondered if the corps peaked too early or if the "City Riffs" show of Leonard Bernstein music had enough depth to carry it through to the end of the season, especially once other corps started getting their shows perfected. Any concerns were put to rest when the corps outscored prior finalists Blue Knights, Madison Scouts, Colts and Carolina Crown to capture the last spot in the 2002 Finals. This was a show where everything seemed to work as planned. The music was playable by the rapidly ascending corps and Myron Rosander's drill formations seemed perfectly coordinated with the music, giving the Santa Clara Vanguard drill writer two corps in the Finals. There was also some humor in the show; a feat quite difficult to pull off in a program of symphonic music. During DCI Hall of Fame announcer Brandt Crocker's introduction of the corps, one can see on the video recording the look of shock that some color guard members were still experiencing being in the biggest show of the season. Performance excerpt of the 2002 Seattle Cascades. The production began with chimes announcing the hour workers had to wake up to face the new day in a very short snippet from "On the Town," followed by blazing yellow flags representing the rising sun. "Profanation" from Bernstein's "Symphony No. 1" was a spectacularly daring work for any corps to approach, much less a corps that was in Division III just two years earlier. Still, the corps showed maturity far beyond its time in the big league, even incorporating a healthy amount of body sculpturing that had to tax the relatively inexperienced members. The down-to-earth elegance of "Simple Song" from "Mass" showed that the corps could also take long breaths and let the audience breathe as well, demonstrating that the creative staff understood the objective of not cramming in every dramatic, technical thing the corps could do within the time frame of the show. "Prelude, Fugue and Riffs" is where the humor and insouciant mannerisms came in, with soloists pushing each other out of the way and the color guard generally acting in an impish manner. This piece also served as the percussion feature, with some quick-paced unison mallet work in front of "walking bass" contras. Various segments of the horn line were featured individually, with a lone contra that didn't get back into position with the others being forcibly shoved into line by a member of the guard. "Make Our Garden Grow" from "Candide" put the finishing touches on the show carrying Cascades' unique imprint and one of the special joys of the season. This week only, you can save on 2002 World Championship Audio and Video Performance Downloads on the DCI Fan Network. Buy the 2002 Seattle Cascades Video Performance Download. (Available this week only for $3.99. Regular price: $4.99.) Buy the Audio Performance Download bundle of all 12 Finalists from 2002. (Available this week only for $15.99. Regular price: $19.99.) Offer ends Monday, April 4 at 8:30 a.m. ET.